Has there been recent changes to Electric Bicycle legislation? 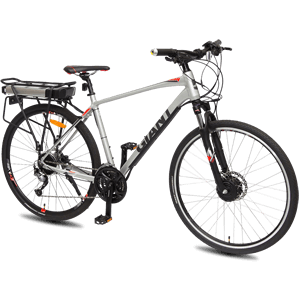 No changes really – but a second category of Electric Bicycles has now been added. What powering options are available? In short you MUST pedal to activate the motor and if you STOP pedaling, the motor stops. Do you require a License or Registration to ride these Electric Bicycles, and Tricycles? No. As the power output rating of the motors does not exceed 250 Watts – they are below the maximum allowable across Australia and thus no license or registration is required – you must however wear a good quality, properly fitted bicycle helmet. Under current Australian Road Laws these electric bicycles and tricycles are considered to be ‘normal’ pedal bicycles. How do I re-charge the batteries? 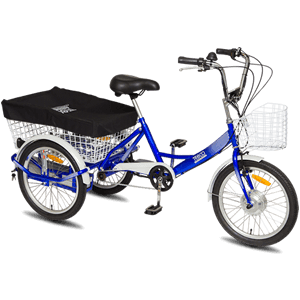 Each bicycle and tricycle comes with it’s own ‘Australian Approved’ 240 volt battery charger – which can be plugged into any standard 10 amp household power point. How long does it take to re-charge the batteries? Depends on the level of depletion of the battery. If the battery is totally flat – re-charge time is about 5-6 hrs. If half flat – about 2-3 hrs. Close monitoring of battery re-charging is strongly advised - once battery is full re-charged then charger should be turned off. When should I re-charge batteries? We recommend you re-charge the battery after each usage or at least when ‘battery status indicator’ shows ‘half flat’ or less. Do the batteries re-charge during riding? No. Re-charging is only effected via the supplied battery charger. How far will the bicycle and tricycles travel between re-charges? There are many variables that affect distance covered between re-charges such as weight of rider, type of terrain, number of stop / starts, riding speed, amount of pedal assistance etc. Laboratory tests have indicated a maximum range of 50km for bicycles and tricycles. Average range on a single charge usually varies from 20-40km. Distance WILL vary greatly from rider to rider, situation to situation – and therefore we CANNOT guarantee exactly what range can be achieved by ANY rider on ANY bicycle. How many re-charges will the batteries sustain? Laboratory tests have indicated that batteries will take Up To 600 re-charges from flat – but many variables can affect longevity of battery life. Battery quality and life WILL vary. Can the bicycle and tricycles be ridden normally? All bicycles and tricycles sold by The Electric Bicycle Co are covered by a 2 year frame warranty and a 6 month electrical and mechanical parts warranty. Warranty period commences on date of purchase. Are spare parts readily available? Yes. A full range of spare parts and accessories are available for all bicycles and tricycles if required. Contact your Retailer for assistance. Basically there is no ongoing maintenance of electrical components other than re-charging batteries. It is advised to keep bicycle / tricycle clean at all times. Mechanical bicycle components require normal ‘bicycle’ maintenance. Consult your Supplier for advice. Will I enjoy riding an Electric Bicycle and Tricycle? 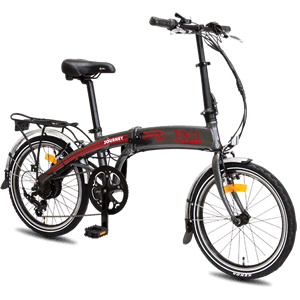 Be assured the feeling of effortless, silent, smooth propulsion by these Electric Bicycles and Tricycles must be experienced to be believed – THE BEST FUN YOU WILL EVER HAVE UPRIGHT. Please call (03) 9584 3000 if you have any other questions.